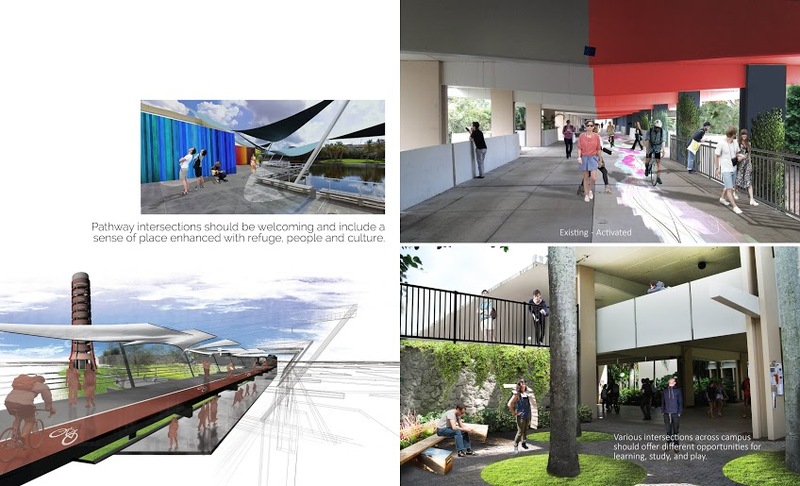 As detailed in my first entry, President Kelly asked the FAU School of Architecture and School of Urban/Regional Planning to envision the future of campus and 20th Street and the results were displayed at the Ritter Art Gallery (and will be until July 20th). The reception for the Ritter Art exhibit was June 10th, so what follows is an account from that event in addition to a boatload of renderings and a few thoughts on ideas presented forth. 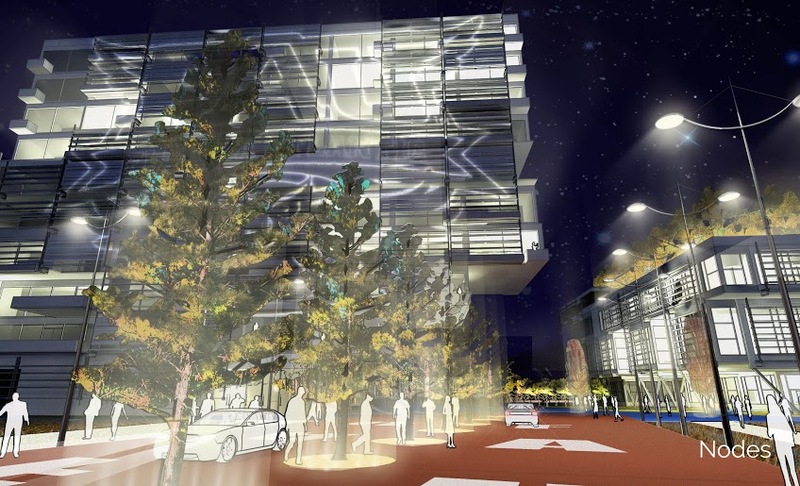 Again, these are not official renderings of projects that are slated to be built but rather a vision of what could be and a goal for both the university and the City over the next decade. Kicking off the night were remarks by some of the key players. Boca Raton Mayor Susan Haynie: "We understand that this is a vital project for our city. The university is at the center of our community and we truly want to be a college town… this idea came fourth about four years but we just never got the traction and to bring the student onboard to come up with the vision is absolutely brilliant… 20th Street was the original entrance of our university, it is now a corridor that needs some help. 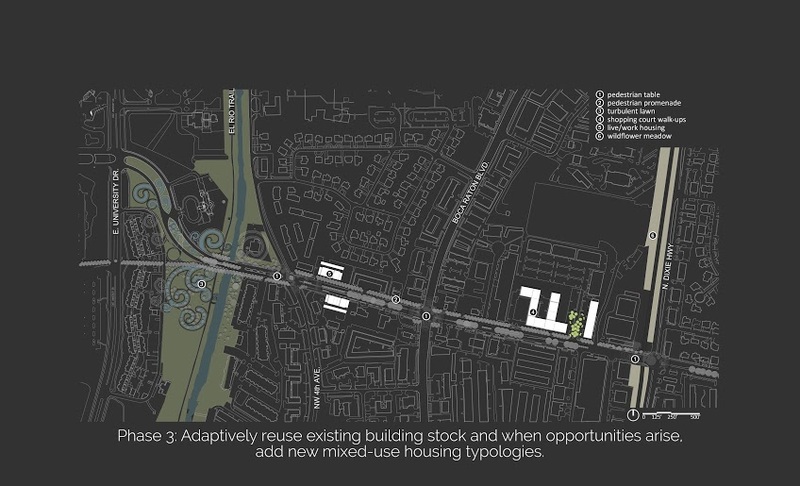 It's industrial, it's got some dated retail, there's really no sense of place and I think the project that you see on the walls here is an exciting vision… so we hope that the university can hand off the vision to the City and we will take the ball and run with it because now we can do the regulatory process, we can find the funding for the infrastructure and we can let the private sector do what they do best and redevelop the 20th Street corridor. But we need a name…. so keep in your mind what you think it should be… but on behalf of the City of Boca Raton, we are here, we are able and we look forward to this collaboration with the university to create this entryway, this college town, this exciting sense of place for our city." FAU President John Kelly: "So how do we think of Boca Raton as a college town and how do we take the vibrancy of young people graduating here instead of exporting them to other places? How do we create an environment where they don't want to leave? … it doesn't mean there's any Boca lost, it just means there is a vibrancy of young people that are looking for opportunities to be successful… the needs of a 22-year old are quite different than those of a 60 year-old." Frank Schedman(? ), co-developer of Atlantic Avenue in Delray Beach: "I am so enthused by a comment that the Mayor made because… for the first time I've ever heard it from a Mayor of Boca Raton… 'OUR university.' Thank you… understand that there are about 50 people who produced what you are looking tonight… we have never had an image to review for this campus or the 20th Street corridor… they tried to figure out the ways by which… the university's presence could be used to enhance the quality of life for the residents of Boca Raton…. to have the community not feel that there was a moat around FAU but instead that FAU was part of the fabric of this community… when the Mayor says we're going to hand off to her the ability of regulating and funding, she's premature. The students need to have a seat at the table for as long as possible… there has to be a task force by which the university can get together with the City on a regular basis to discuss the movement, the town-gown and the quality of life that the president is interested in having." Love the projected logo (despite it being the dumb full Owl logo instead of the infinitely better Owl Head logo ;) and the "FAU" on the streets. I'm not sure if this represents anywhere specific on campus or just the general idea of nodes and the thought of bringing campus all the way up to Glades Road. Let's pause a moment here. First of all, the "activated" Breezeway in the top right (representing the top floor of the Breezeway) with the red and grey paint… badass. I'm all about that. The rendering below it represents the west side nooks across from GS which has seen some slight variations for the year but has never really found a comfortable renovation that would draw people into the space. 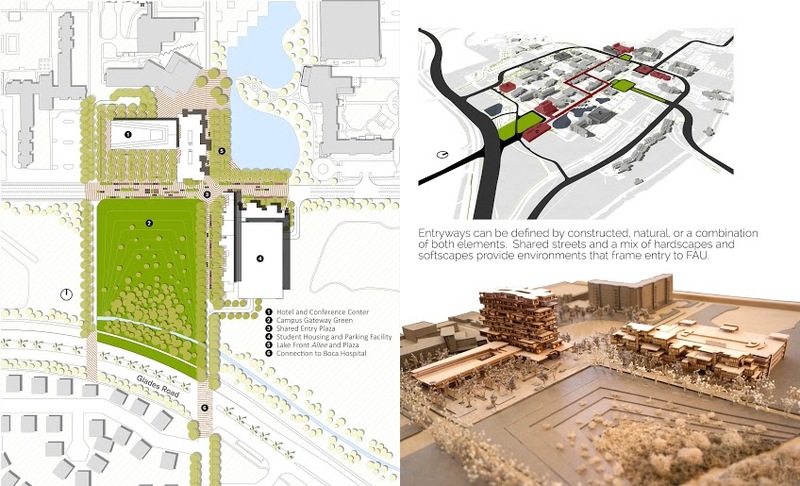 The bottom left either represents the Breezeway with a carillon tower on the main quad or represents the idea that was proposed of extending the Breezeway east towards University Village/20th Street and towards a possible 2nd Breezeway system that would extend north-south from the Parliament Hall area to the proposed hotel/conference center. The top left image represents a renovation of the "dock" space behind the art building; as you may know, those poles that the seagulls nest on were originally supposed to be poles for the triangular shade sails as represented in the picture but, if I remember correctly, the funding ran short and no one has ever seemed to make a renovation of that area a priority. I'm actually hoping to write about that area in an upcoming entry about parts of campus in desperate need of renovation. 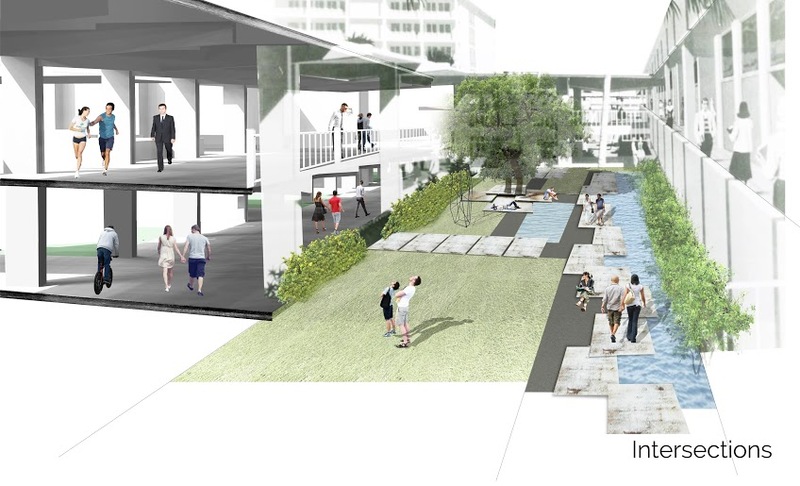 Basically, I think FAU could make better use of that space to both connect it with the art being made there and to capitalize on the proximity to the water to introduce some extracurricular water activities for students. 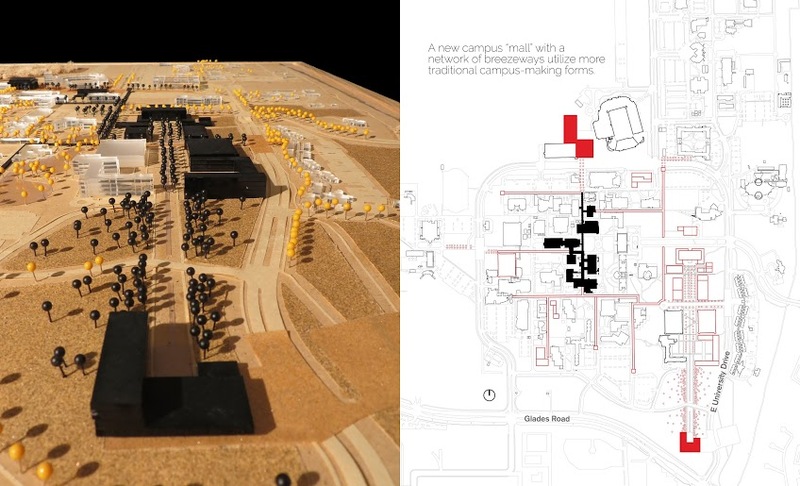 Because really if you look at the campus overall there are large parcels in the southeast corner for development of future academic buildings, so in a sense there's a whole quarter of campus that can still be built over that way. As such, it would be best to game plan for it as a dedicated mall flanked by buildings rather than to build it piecemeal along the way and constantly have to reevaluate paths and drainage in light of new construction. 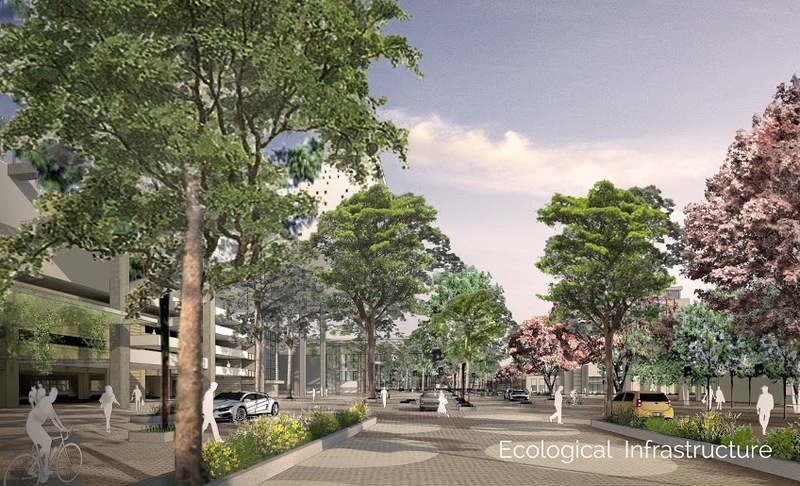 And before we leave campus, here's a rendering showing how we can buff up our green space on campus and add more shade trees. The building on the left is the new (Stadium) Parking Garage 3, to help orient you. There were other pictures and boards explaining how we can create distinct botanical/ecological zones on campus so that walking across campus allows you to have a variety of specific natural experiences. I also very much appreciate that the students pointed out, on several occasions, that we need more than palm trees to enhance walkability. Right now Boca Raton is experiencing temperatures in the mid-90s and that's not unheard of for the Fall either, so if you expect students to walk across campus in this heat they need every bit of help they can get. Sunshine is overrated, shade is underrated. More trees, more shade structures, maybe even misting fans along the way ;) Whatever it takes to keep students cool! This is essentially where the City comes in to start the ball rolling. 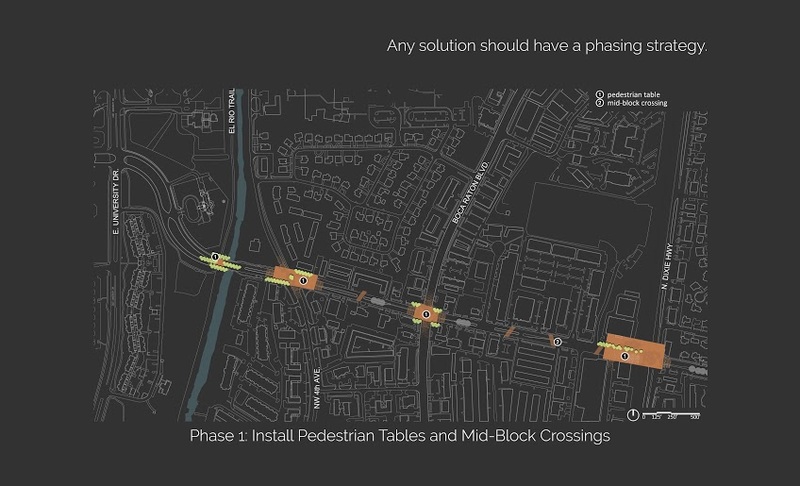 With this vision, they can start applying for different funding resources to start converting 20th Street into a more pedestrian-friendly area. First you define key intersections and modify them with pavers/elevation/landscaping to start defining space and encourage more walkability. 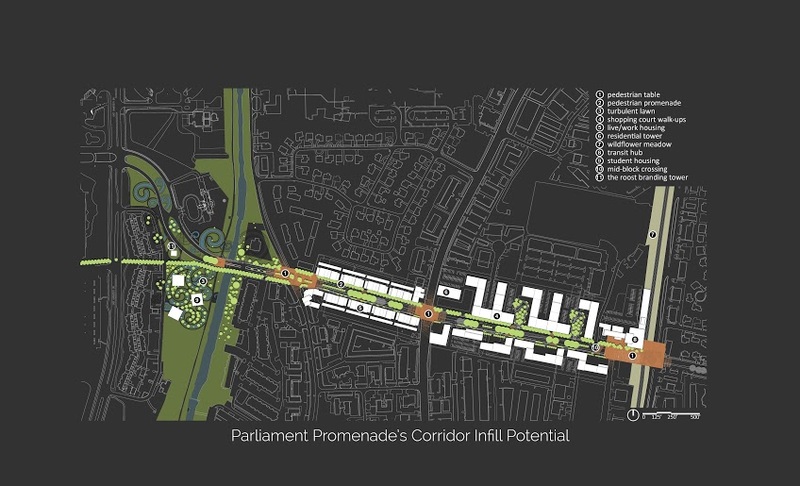 The students came up with the idea of Parliament Promenade and that's a great name to define an FAU-centric pedestrian pathway. 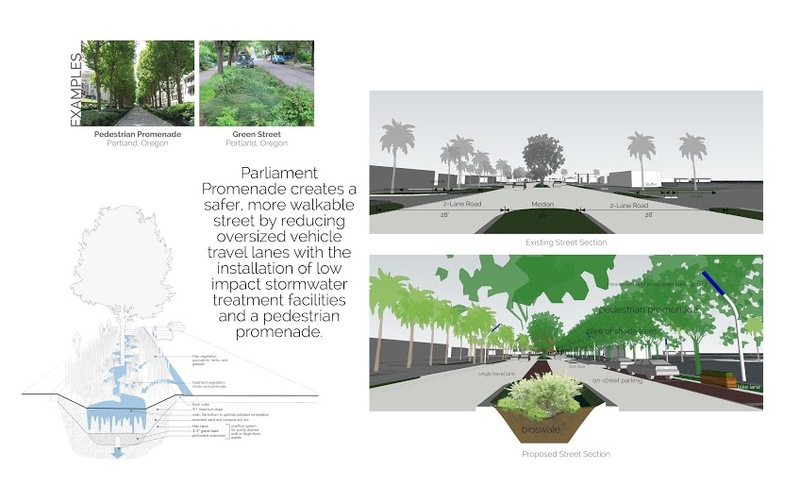 This board shows you the difference between the existing street and the Parliament Promenade concept, but in general just think wider sidewalks, pavers, shade trees, defining landscaping, maybe street art, hopefully streetlights with FAU banners on them, etc. one of my favorite ideas that I came up with is the idea of dedicating certain spots along the inevitable parallel parking for permanent "Park(ing) Day" spaces. If you're unfamiliar with that national trend, feel free to Google it or just checkout pictures here, here, here annnnnnnnd here. In doing so we would have artistic touches to our street, we'd be cutting edge and provide extra entertainment, and it would help to cement this particular college street as unique among others. 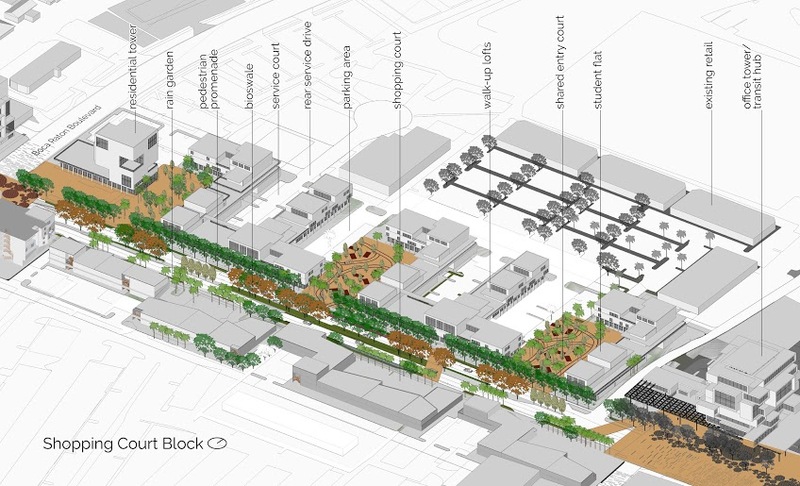 With regard to the actual facilities along 20th Street, the vision broke it up into two distinct sectors: the "Burrow live/work" area that's the half of the street closer to campus, and the Shopping Court Block as the second half more to the east leading up to Dixie. As a side note, I really dislike the boxy "Miami" style of these student dorms but a) if that's what it takes to keep the property affordable, have it, and b) it's only a rendering. 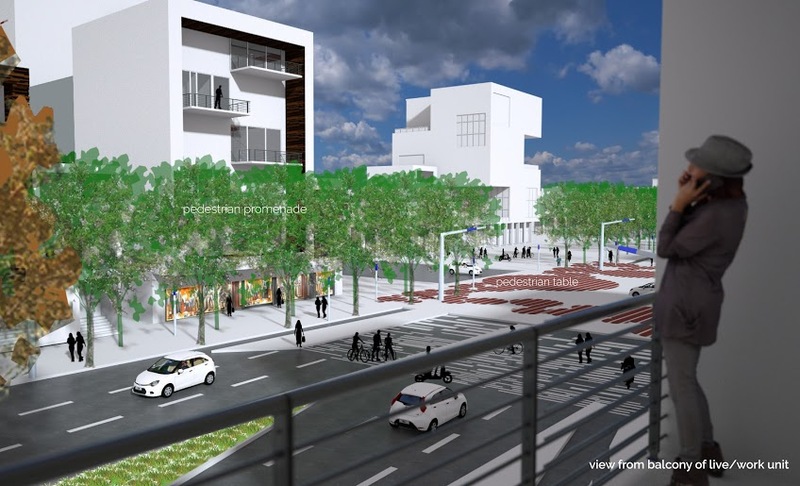 The upside is that the renderings show the balcony facing the street and I think it's crucial for students to be able to sit on their balcony and soak up the atmosphere, especially if there are celebrations going on below because of a street fair, holiday or FAU football victory. And to end it, here's a rendering as if you were hanging out on your friend's balcony overlooking 20th Street. Pretty cool. So this is the vision as presented so far. Still a lot of pieces to fall into place. As I stated before, the biggest issue in making this a reality is not money or interest from private developers. In fact, one event attendee remarked that, "If he could, Alex Rosemurgy (CEO of Rosemurgy Properties, otherwise known as owners of University Park/View/Square) would buy up and develop the entire street himself." I had the pleasure of meeting Rosemurgy and can attest to that fact; he's very involved and excited about the future of 20th Street. He told me that tons of major student housing developers are chomping at the bit for the opportunity to capitalize on 20th Street but the current owners of key properties are in no hurry to sell. The question then becomes, "what does it take to get these people to relocate so we can build out our vision?" Rosemurgy went down the line of the model, pointing at building after building, explaining to us who owned it and the difficulty of acquiring the property. Hes clearly done his homework, as has FAU, which had up a graphic showing every single owner of a property along the 20th Street corridor. Very impressive but depressing work because we have to find a way to convince so many different property owners to let us change things for the better. 2) This street truly has to be FAU-centric, from the design of the Parliament Promenade to the tenants of the properties in the retail units. If you can copy and paste this street to Boynton or Miami and no one would notice a difference, it has failed. I hope they look hard at successful off-campus streets at larger universities, that they "embed FAU into the buildings" as Kelly mentioned way back when, and find creative ways to integrate Owl pride into the physical makeup of 20th Street. There are tons of ways to do this so if it hasn't been done it's because no one tried, not because it's impossible. FAU banners on the street lights, FAU logo on the garbage cans, owl statues, red and blue benches, maybe even convert one of the intersections into a roundabout with a central fountain and an "FAU", "OWLS" or owl statue installation rising out of the fountain. I'm hopeful the university doesn't overlook this. The other interesting comment by Dr. Kelly was (paraphrase, not exact quote): While I am President, I will not approve any new on-campus dorms. We do not need to be in that business when the private sector can take care of it. We can use that money for academics. I have to agree. 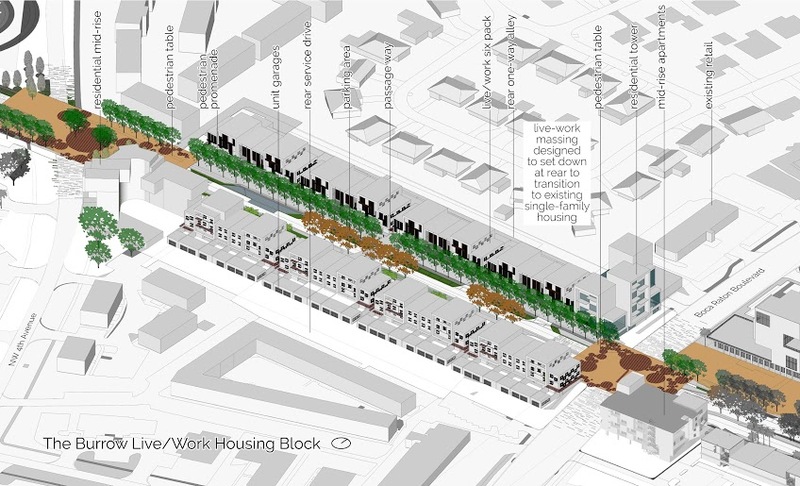 Most of us always felt that the only way to end the commuter school feel was to build more on campus housing, but now with developers on board like Rosemurgy, etc., and the idea of creating a corridor, the need to build on campus housing is reduced and the traditional campus feel can take place without it. 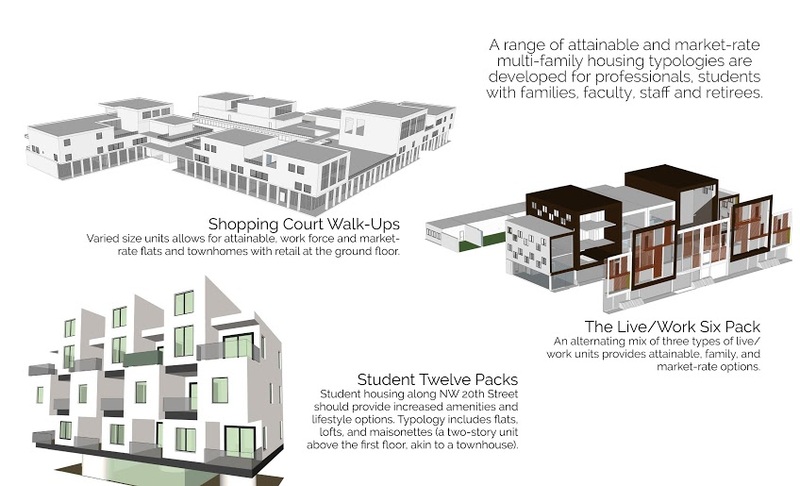 I agree that the building of dorms can be slowed due to the creation of the corridor, and that the corridor will go a lot further in building the traditional and college town atmosphere than springing up dorms. But I don't think dorms should be abandoned, because as the campus and town changes and more students look to move on campus/in the corridor they should have sufficient on campus and off campus options. That being said, in my opinion only around two more dorms should go up and the remaining space should be for academic, research, and athletic facilities. By two more dorms, I mean general student population dorms. There should still be a place for Greek housing and scholarship housing(bpw house) on campus. 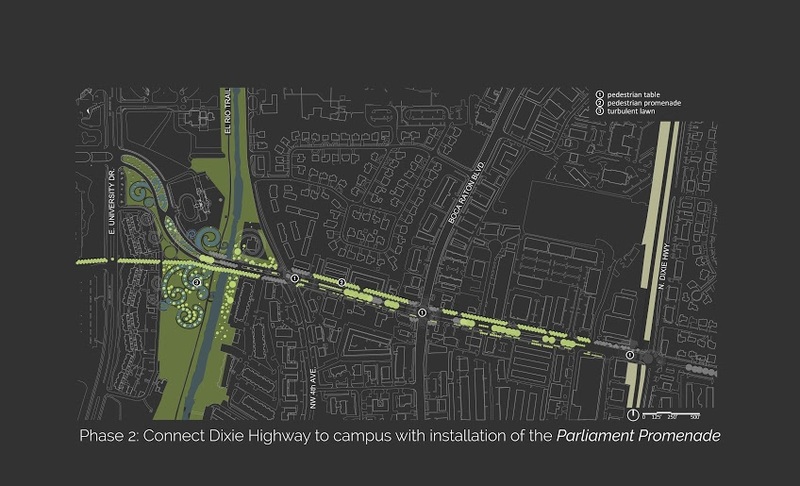 I do like the idea of bringing campus development closer to glades road. There is no reason that the community should be able drive on glades road and not even realize that there is a major university right next to them. This problem was even more evident before the fau banners were placed on glades road. FAU should be visible to the community, and if plans are to eventually connect to Boca hospital, then developing the southern part of campus will be a must.